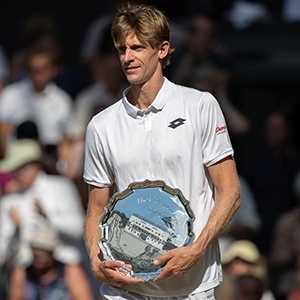 Cape Town - Kevin Anderson has hinted that nerves, rather than fatigue, got the better of him at the start of his Wimbledon final against Novak Djokovic on Sunday. The South African lost the first two sets 6-2, 6-2 but regained his form in the third set. He had five set points on the Djokovic serve but failed to capitalise, with the Serbian eventually clinching the set and match 7-6 (7/3). Anderson entered Sunday’s final having played more than 21 hours of tennis, including a six-hour, 36-minute semi-final win over American John Isner. “It was a tough start for me. But I was definitely quite nervous starting out the match. (I) didn't play great tennis in the beginning,” Anderson said in his post-match press conference. Anderson admitted that he was feeling the effects of his previous matches but felt he could have continued had he managed to extend the contest. “I didn't really find my form the way I wanted to. Of course, my body didn't feel great. I mean, I don't think you're going to expect it to feel great this deep into a tournament when you've played so much tennis," he added. “I tried my best to keep at it. (I) definitely felt much better in the third set. I thought I had quite a few opportunities to win that third set, especially a couple of the points where Novak hit a couple balls, I thought they were actually going out, managed to land right on the line. Anderson added that the recovery process from Friday’s marathon - the longest semi-final in Wimbledon history - was gruelling. “Honestly, Saturday was pretty tough. There was a lot of thoughts going through my mind of, ‘Am I going to be ready to play another three-out-of-five-set match on Sunday against somebody like Novak’. “Getting here to the courts, seeing the doctors, seeing the podiatrist for my feet. Having a very light hit, I probably only hit for 10 or 15 minutes... you go through certain exercises that I do... when things aren't feeling the way they should, you always have a little bit of doubt.